Dressing up a Standard Spiral Kit by Stairways, Inc.
Pictured is a code compliant 72” diameter standard spiral stair kit. All of Stairways, Inc.’s spiral stair model parts are interchangeable. 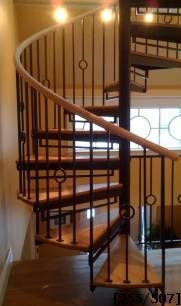 You have the option to change the steps, balusters, and handrails to customize your spiral stair to suit your needs and get the look that you want. The owner of this stair added oak step overlays and a 2” round oak handrail. The minor changes made a major impact. We worked with our customer on the design of their center baluster to help them get the look they were after. This gave the spiral stair a finished look. Closed riser bars have been added between the steps. In some cases, building officials want to see less than a 4” separation. Though this is not always required, it is best to check with your local building department. This is not covered in spiral stair codes but, can cause a disruption in your project, by some code officials. Stairways, Inc.’s standard kits ship knocked down for economical freight cost and the ease of installation.